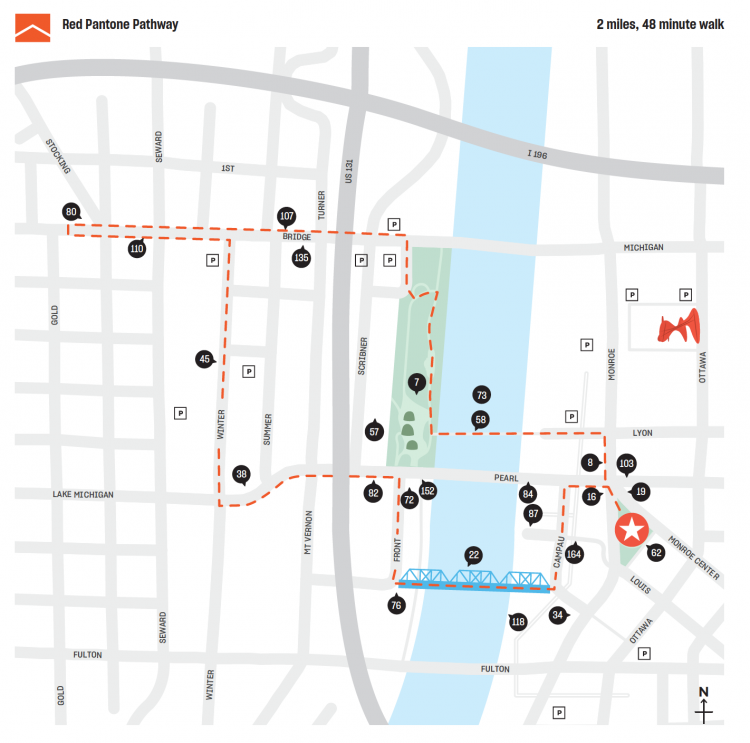 The Pantone Pathways, presented by X-Rite Pantone, return to ArtPrize 10 and will take you within one block of most ArtPrize venues. All five start at the Visitor Pavilion, and some conveniently intersect with DASH routes throughout the city. Simply follow the colorful sidewalk stencils and use the venue listing (on the middle centerfold map) to visit venues on the route. All Pantone Pathways are curated with your accessibility in mind. 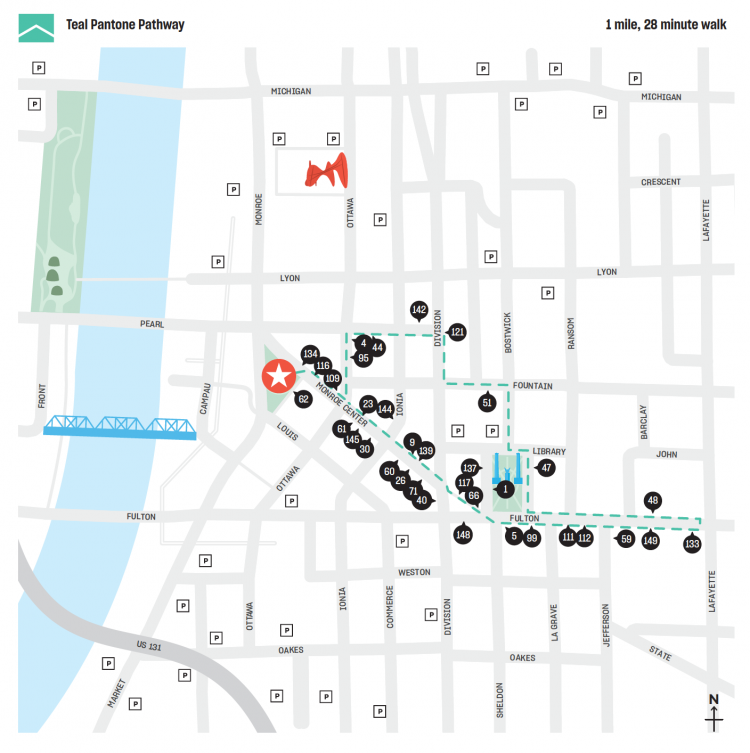 Find individual Pantone Pathway maps below and in our ArtPrize 10 Event Guide. Pick up a free Event Guide at the Visitor Pavilion at Rosa Parks Circle (thanks to MLive Media Group), or view + download via Issuu. 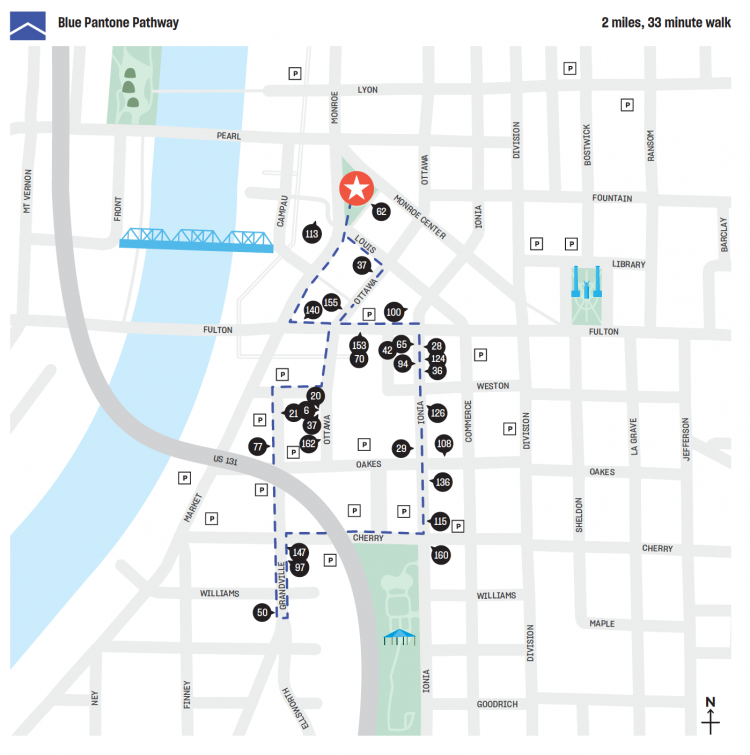 Marked by vivid, blue stencils is where you’ll find the Center City Pantone Pathway. 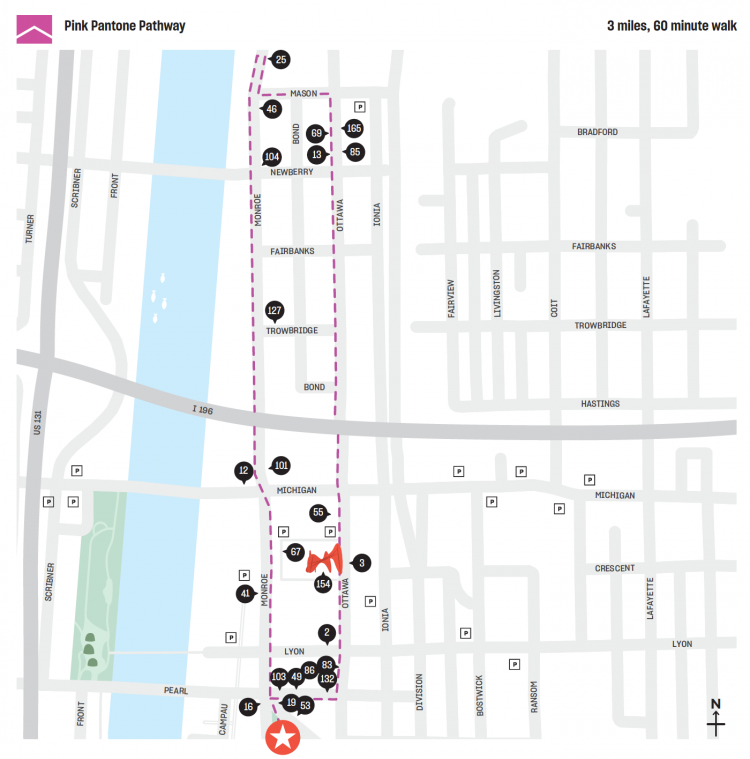 Covering 2.2 miles of downtown territory, the Center City Pathway will weave you in and around the epicenter of Grand Rapids, leading you to a profusion of Featured Public Projects, Pitch Night and Artist Seed Grant winning entries. Need somewhere to start? Stop by Venue Grant recipient, the Grand Rapids Art Museum (62), to view their carefully curated exhibit. Luckily you won’t have to go far to check out ambitious, large-scale installations because the Grand Rapids Art Museum is also home to Featured Public Project and Pitch Night winning entries. Do you get excited about ambitious, large-scale installations? If so, make sure to stop by Western Michigan University to explore an awe-inspiring Pitch Night winning entry. If you see striking, red stencils beneath your feet, then you’ve found yourself on the Westside Pantone Pathway. 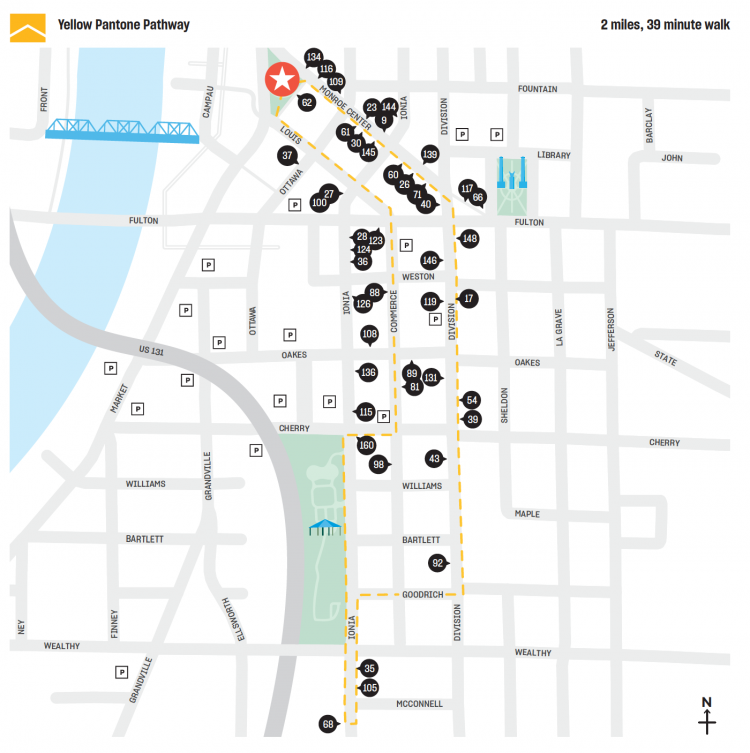 Winding through two miles of downtown is where you’ll encounter Featured Public Project, Pitch Night, and Artist Seed Grant winning entries along this 2-mile loop. Before ending your journey, take a stroll over to Grand Valley State University (76) to explore one of the five Pitch Night-winning entries. If you find yourself following a path marked with bright teal stencils, then get ready to embark on an art-filled quest. 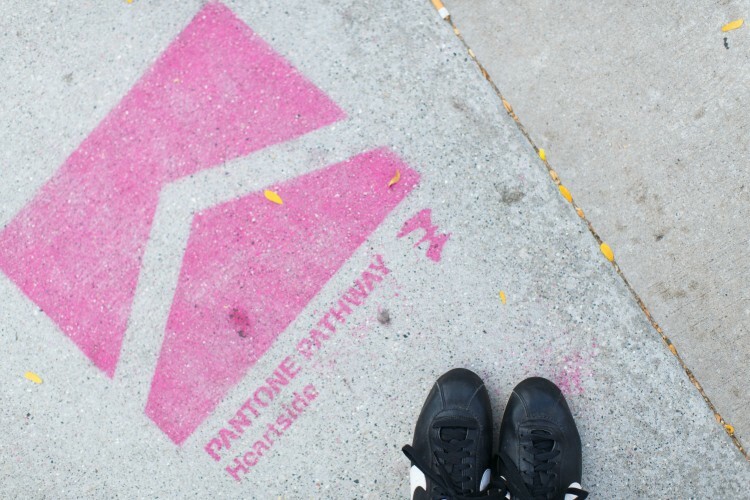 Covering one mile of the ArtPrize district, the Hillside Pantone Pathway will lead you through one of the nation’s most architecturally captivating neighborhoods. When you step into these exhibitions, be prepared to immerse yourself in artistically conscious and diverse atmospheres.